My name is Dave and I’m a BMX rider. I’ve been riding BMX for thirteen years. I’m twenty-five years old and I ride motorcycles. Taking a step back to my childhood I always dreamed of having a motorcycle, my dad had cool Harleys, and now has the newer models. I went for my first motorcycle ride when I was seven years old and since then I wanted a bike. One month out of high school I got my first motorcycle, I was nineteen years old. I started as a wanna be biker and some would say why are you wearing skateboarding clothes? In high school I was responsible and didn’t drink, I was afraid of the consequences that may result from drinking and driving. My senior year in high school I went to a reenactment of an alcohol related accident. It was a situation where some drunk high school kids got into an accident and their friends were hurt. I was to go back and warn my classmates what may happen if you drink and drive or are under the influence of drugs while operating a motor vehicle; this was just before Prom. Fast forward six years and just over a hundred thousand miles, I’ve been to some awesome places on two wheels. 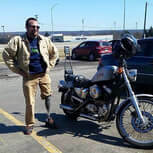 My second year of riding motorcycles I rode to Sturgis for one of the biggest motorcycle rallies in the world. Man was that amazing, a dream come true riding a Harley almost across the country and I did it by myself. I met up with some family friends that went out there and had the time of my life. I’ve been to the sunshine in the south, the beautiful crisp mountains of the New England states, the Smokey Mountains, but the west was the best when I went to Yellow Stone National Park. I camped and rode for eleven days straight; no motels. What is the most important thing in life? Family? Friends? Health? Materialistic things? A good Job? I care about being independent and supporting friends and family. It took me a while to become an electricians apprentice but I didn’t give up on what I truly wanted. On August 17, 2014, I was out for a little ride with my buddy Gabe, a good dude I used to work with. A Nice day about – 75 degrees and we cruised along the Lake Erie shores and on into Pennsylvania. Gabe and I debated on which way to go while looking at a map. Gabe was always a safe rider, always staying back pretty far in the case of an emergency. I was cruising along on my bike and thought, oh crap this person is swerving! I’ll just hug the white line and this person will correct himself; probably on the cell phone. Unfortunately, the guy driving was three times the legal limit; beyond drunk. This guy hit me pretty much head-on and I flew through the air. When I woke up I was going to tell the person what an idiot they were but I couldn’t get up? Why? Well, I checked myself and it was a gory sight. A lot of thoughts on how this would be fixed. I was in pain, denial, and confused. That Sunday on August 17, I nearly lost my life. Then a lady named Amy, who I’ve never met until then, started to pray for me; that’s when I knew it was serious. I guess I was in fear for my life; I asked Amy to please hold my hand, and she did. An off duty state trooper and a 15-year United States Marine tied a tourniquet around my right leg. I was life flighted to the hospital and six hours later and a ton of prayers, I woke up in an ICU. There were hands on my shoulder and hoses coming out of my mouth and they told me, Mr.Klar “We had to amputate your leg above the knee.” What? With tears in my eyes, I thought I’m not going to walk my dog again. My mom was at the door of the ICU and said someone wants to see you. Ughhh……. although it was a beautiful sight it was my caring, camping, lovable friends Matt and Tammy. I’m broken what will come of this? Through boring somewhat silly hospital stay I was urged to go with a certain prosthetic company whom I’ve heard some crappy stuff about. No doctor, I’m not going with them! They are no good! Besides an amputee told me in physical therapy they heard of 50legs. So I looked up some info and found out 50legs patients get their prosthetic care at POA. WOW! POA, where all the active amputees go! Maybe I’ll give it a try! I honestly gave it some serious thought. I talked to Steve at 50legs and he told me his story and explained about POA. Then we had an understanding and a few chuckles. He’s a biker, he’ll make me feel comfortable. Then came the days at POA. I’m scared, how the hell is this going to work? I talked with some others with limb loss they made me a bit more comfortable. I tried to be tough. I went to the gym with a walker before POA; my twin brother pushed me to be strong and my parents made me work for my own. My dad taught me the value of hard work. I carried on and listened to the great people at POA. Steve is responsible for me arriving at the prosthetic clinic and a comfortable stay in Orlando. This is kinda funny, on my third day of being fitted and walking a little bit in the parallel bars, my prosthetist Ronnie had me walk with crutches for 2 minutes and told me I could leave. “What!? You’re not going to hold my hand?”, I said jokingly. Ronnie showed me the stairs and I was off; trial and error here we go. I left POA with crutches, with practice, and determination. I got to walk with a cane but that only lasted two days and I left the cane behind the couch. My twin came on Christmas Day and I walked one mile without assistance. With even more determination I walked two separate 5ks. With the help of everyone at 50legs they made my dreams and goals come true, by giving me the gift of walking again, and my freedom of independence. 50legs also gave me hope to walk with my dog Ruger again. Ruger is kinda afraid of the prosthetic but she stays by my side. This is not the end of my story; so many more accomplishments to come! NO EXCUSES! !